The design workshop by the good folks on the Gardening Gone Wild blog is about trellises and screens this month. A worthy gardening topic since we all have dreams of luscious flowers cascading down and through a trellis or screening one of those eyesores we all have. Here are a couple from my yard, minus the luscious flowers at the moment. The first one near the round window was designed by my friend Alexis and built by a local man talented in the art of iron work. It gives a bit of modernity (sp?) to a traditional rose garden and house. This picture was taken last year when the Madame Alfred Carriere climber was not yet in bloom. This year it's zoomed over the top and is now climbing on the flat roof. Guess the trellis wasn't tall enough after all! The other trellis is actually a very old Egyptian gate. I bought it several years ago with the idea that I was going to screen an area under a staircase. But I never got around to that and so I schlepped it to Louisiana when we moved. It now sits towards the back of the yard in line of sight from the deck. My grand plans were to have a clematis grow up through it but sadly, it's still a rather wimpy vine. This area gets dappled shade most of the day until towards the end when it gets blasted by the sun. So it's a challenge and if you have any good ideas of what vine will tolerate that, let me know. Beans seem to grow just about anywhere for me. Either edible ones or purple hyacinth beans are really pretty. Great idea, thank you! I hadn't really considered annuals (except for the sweet peas I planted way too late), so I may give that a try next year. I love the look of purple hyacinth beans. Let's see, if you wanted to keep someone from coming through that ornate gate...maybe a nice thorny, evergreen pyracantha. I started thinking of the gardener's challenge it would be to train that on a trellis though (i bet it could be done though). Since one of the appeals of a pyracantha is its berries, I started to think about other interesting berry bearers. How about a Beauty Berry? I love the clusters of purple berries that are left when the leaves fall off. It is just a thought, I don't know how trellis worthy it would be for a shrub. Hi there, Jean! Thanks so much for your contribution to this month's Design Workshop at Gardening Gone Wild. I'm so sorry it took me so long to come over for a visit. 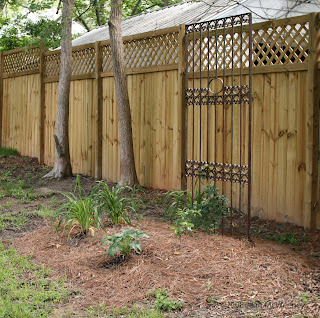 Your custom-made trellis and the Egyptian gate are both lovely (and so is your fence!). I second Heather's suggestion of hyacinth beans to accompany the clematis next year. Or, for something a little more delicate, maybe love-in-a-puff (Cardiospermum halicacabum)? If you'd like to try it, I'd be glad to share some seed. Thanks for the compliments Nan (and right back at you - I love looking at your garden). Unfortunately Cardiospermum halicacabum is listed as a noxious weed in Louisiana, so I probably shouldn't go with that one. So purple hyacinth beans may be what I try next year. Thanks! Very nice! I like the fact that they look great even without anything growing on them. 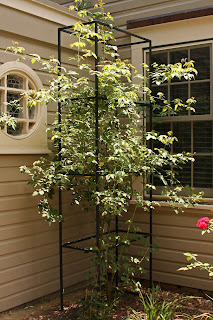 Seeing that custom trellis gives me an idea for a corner of my garden that needs something to jazz it up!